Had a lovely stay! great vibes, good selection of fun things to do! Great location, wonderful staff, REALLY clean, owner made to large pot of chili for the free dinner . Great vibes. Great value for money. Easy check in and check out. Short drive to the airport. Walking distance to bars. Staff extremely helpful and friendly. Sam was amazing. My stay at this hostel was alright. I stayed at a room with 12 people. There were no troubles or rowdy guests during my stay. The bathrooms were clean and comfortable. Good kitchen area although might be cramped when everyone's there at the same time. Easy location especially at night since there's Domino's and OTR nearby. Although the wifi sometimes doesn't reach the room. The staff and location are great, top notch. Their daily activities and socializing opportunities are real good too. Lack of upstairs toilets meant having to go between floors which was a tiny inconvenience, and breakky is simply white toast with spreads and wheat bix. Laundry is $5, not $3 as said in rooms and on welcome sheet. This place was great for a cheap single room. Unfortunately the whole hostel smells of feet, as everyone seems to leave dirty boots everywhere. There were empty beer bottles in the shower, and a missing pane on a window which limited privacy in the shower. My sheets had bloodstains on them. Don’t smell the duvet covers - who knows when they were last washed. Someone started vacuuming in the corridor at 1030pm. Walls and floors so thin you can hear everything happening. Lots of street noise too. Had 3 bed private with friends. Room itself was ok because it was private but beds were insanely squeaky. Also, there was 1 toilet on the 2nd floor where most of the rooms were so you had to go downstairs most times, not ideal. Lot of long term stayers so the vibe was a little daunting cause everyone knew each other and kinda looked at you like “what you doing here?”. Staff great, helpful & friendly. Location good, quite central to everything. I was shocked to find this hostel dirty and with a very poor vibe, after the overall positive reviews. 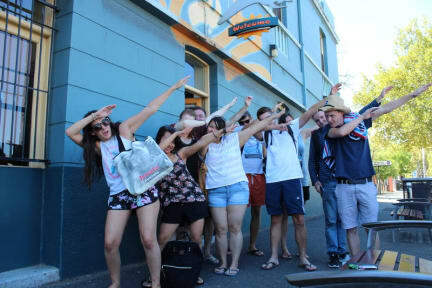 If you're looking for a cool hostel in Adelaide, look elsewhere. My friends who stayed at the YHA hostel were happier--I'd suggest going there.